There's no easy way to get Exotic weapons and Armour in Destiny but the Exotic Bounty is at least a guaranteed method. Of course, you've got the slim chance of winning one via a Blue or Purple Engram but the chances are less than 1%. There's also the opportunity to buy Exotic gear from Xur with Strange Coins, but they're about as rare as Purple Engrams. 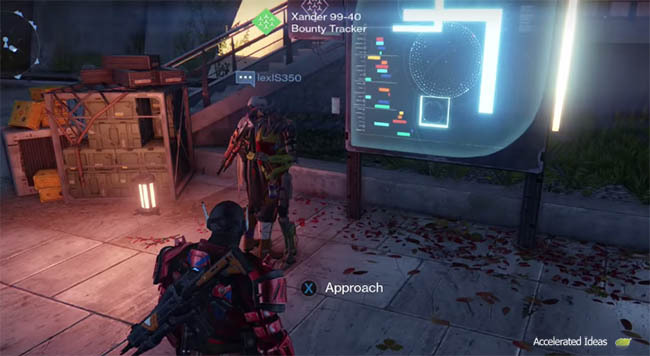 There's a lot of confusion surrounding Exotic Bounties with some people believing that a minimum Level applies or a certain number of Vanguard Marks will help you trigger the Bounty. 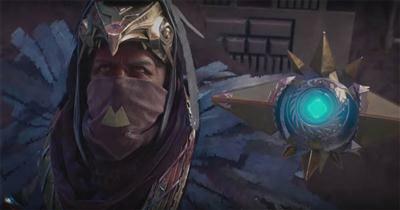 Others believe that trading in enough Bounties in one go will make the Exotic Bounty appear immediately. I'm going to set the record straight on this one and clarify exactly when it appears. Exotic bounties are clearly identifiable because they're the same colour as Exotic Engrams and other Exotic gear i.e. YELLOW. Although you can receive a Vanguard Missive from the Postmaster the common way to receive an Exotic Bounty is after trading in another completed Bounty. So the more you can complete and collect, the more chance you have of seeing the Exotic Bounty. It makes no difference if you trade in one or four at a time. You'll just increase the chance of it appearing because you're trading in more of them. 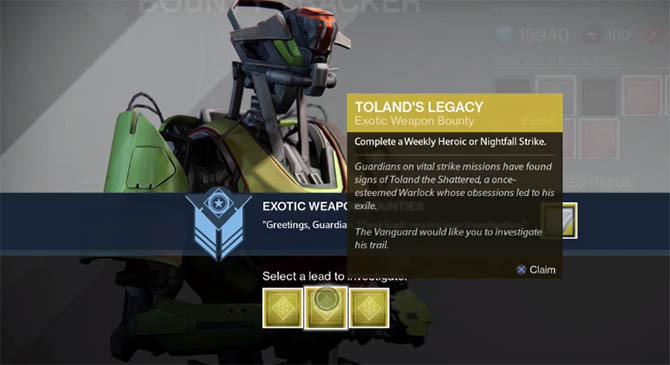 The chance of seeing the Exotic Bounty is about the same as receiving a Legendary weapon from a Blue Engram i.e 1%. As mentioned above, sometimes the Postmaster will have a Vanguard Missive for you to collect. This is the second way to kickstart an Exotic Bounty (besides collecting completed Bounties). These missives are coloured yellow as with other Exotic stuff so you'll know the importance once you see them. Simply take it over to the Bounty Tracker and the three choices will appear on screen. Unlike Vanguard and Crucible bounties, Exotic bounties are time consuming and in most cases difficult. There isn't one set of criteria but several tasks to get through, usually spanning over several areas including both PvE and PVP. One example of a length/hard task is to kill several hundred enemies on the weekly Nightfall or complete 25 Strikes. Further down this page I've listed each of the Exotic Bounties, weapons and tasks to complete them. There's no way to cancel the Exotic Bounty and choose another, so choose wisely based on the Steps described further down. Some of the weapons are incredibly hard to acquire and many players simply give up half way. If you want to do another Exotic Bounty then you'll need to earn another Vanguard Missive which gives you the chance to select from one of three bounties at the Bounty Tracker. Which weapons can you earn from Exotic Bounties? Below is a list of the Exotic Bounty tasks that I've seen so far….